I feel myself s-l-o-w-l-y catching up on bits and bits of little stuff that need to be done, you know, the kind of things that can keep you awake at night....anyways, I thought I would share some quick pics with you of some of the little things I've done lately. Nothing spectacular mind you, but just a few little "day brighteners" as I like to call them. 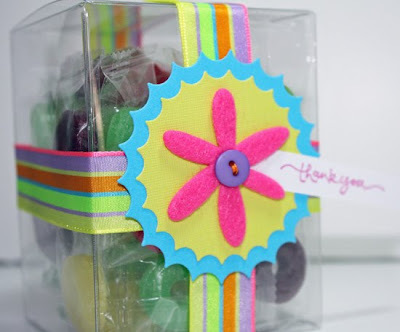 First up is a little candy box I decorated for the sweet gal who taught us how to make and roll the lumpias. I love these little clear plastic boxes and they make the perfect containers for sweet treats like chocolate kisses or, in this case, tangy flavored lifesavers. I don't remember where I picked up the bright colored ribbon, but it matched the theme. I also used my Spellbinder dies and a felt flower from Making Memories. 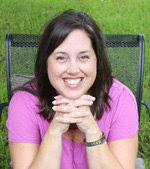 The stamped flag is from Stampin' Up. 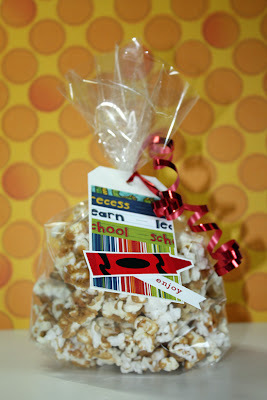 Next is one of two bags of Butterkrunch popcorn I made for Orientation at school yesterday. I thought the teachers might enjoy a light snack and it was too hot and steamy for chocolate. This recipe is soooo good (tx, Katie!) and it makes a ton. I was in a time "krunch" so I just went to my stash of school papers and grabbed a white tag. I also went to my sticker supply for the crayon. The "enjoy" sentiment is from PTI. Both of our teachers this year loved the gift and one even said, "Ooooh, you've got an A.....how did you know I could be bribed?" Last is a quickie card I made using my new Hearts & Bracket die from Stampin' Up. I owed a card along with a baby gift to a friend I knew I would see yesterday at Orientation, so I whipped this "baby" up right before we left. I was afraid I would run out of time and not get a picture, but I managed to have an extra 10 minutes. 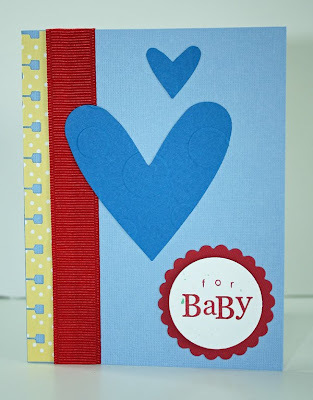 I also used my Spellbinders scallop die and my SU spiral edge punch. The stamped sentiment is from PTI's Mixed Messages set as well as their simple alphabets. It's a little hard to see, but both of the hearts were embossed with the polka dot folder from Quickutz. Love the large dot sizes on that one. And, that's it for today! Have a good one!